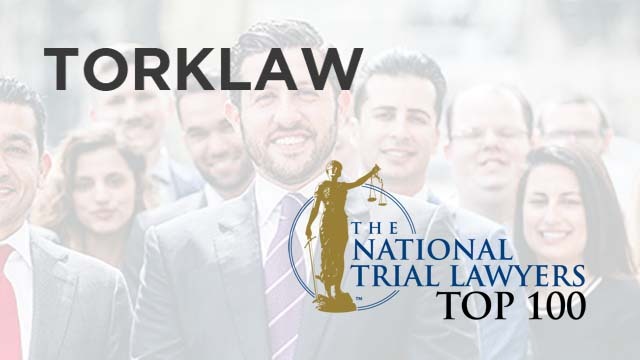 TorkLaw has been selected to join The National Trial Lawyers Top 100, an invitation-only group that comprises the best trial lawyers throughout the nation, based on rigorous qualifications. The National Trial Lawyers is a professional legal organization of U.S. trial lawyers who demonstrate first-class qualifications as civil plaintiff or criminal defense trial lawyers. It is an essential source of information and education for the country’s leading trial lawyers, with the goal of protecting our system of justice, and ensuring it is balanced and available to all. Selection for The National Trial Lawyers: Top 100 is a an exacting and thorough process that includes peer nominations and objective research and analysis. Only the most qualified lawyers from each state are invited to join. These attorneys must demonstrate exceptional leadership, stature and public profile in terms of their reputation and influence on their communities and the legal profession. TorkLaw is honored to be included in The National Trial Lawyers Top 100, proud of the work of our stellar attorneys and employees, and grateful to our clients for placing their faith in our firm.